Brightly coloured Cottage Garden A4 paper for crafts and artists (pack of 10 sheets). 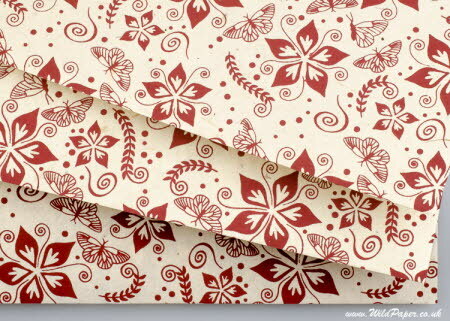 Reddish brown screen-printed design of flowers & butterflies on cream-coloured natural lokta paper. This bright lightweight 55 gsm lokta craft paper is thin and flexible and great for a wide variety of crafting projects. It has a smooth calendared top surface and a slightly less smooth reverse surface in plain cream.